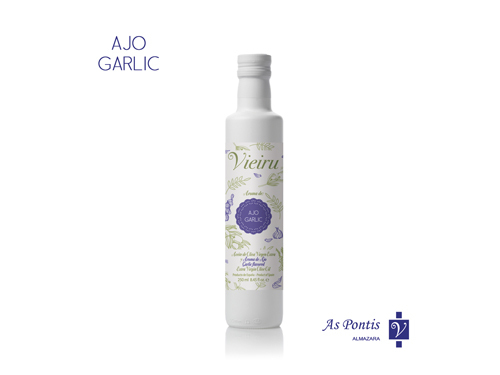 Flavoured extra virgin olive oil obtained through soaking of Extra Virgin Olive Oil ‘Vieiru’ 100% Manzanilla Cacereña olives and garlic beans. It mixes the health properties of extra virgin olive oil and garlic: rich in iron, beneficial for the circulation of the blood and diabetes. Very recommended for charcoal-grilled meat, salads, fried food and toast.